Eastern Oregon University has issued a proposal to increase the number of eastern Oregon residents who attend and graduate from college. EOU is committed to providing early college learning opportunities on high school campuses throughout the region. Sponsored dual credit /dual enrollment provides discounted tuition rates to high school students who are attending regional high schools located throughout eastern Oregon. SDC is defined as the award of secondary and post-secondary credit concurrently for a course offered in high school during regular school hours. To receive dual credit, EOU will authorize credit for approved classes taught by qualified instructors at regional high schools. Eastern Promise will provide increased access for high school students interested in earning college credits. Classes are delivered in the high school classroom by high school teachers, enabling students to earn early college credit. Eastern Promise early college credits also satisfy high school course requirements. 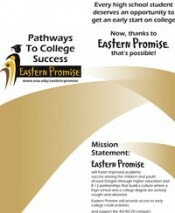 For more in-depth information please view our Eastern Promise Student Handbook . The 2017-18 academic year tuition/costs for these classes is $31 per credit hour. Approved teachers/administrators at the school will assist their students with completing the online non-admit high school application, and send the Parent Financial Responsibility form home for parents to sign. Student returns the completed form to the high school teacher. EOU requires the Parent Financial Responsibility form prior to course registration. Teachers/administrators will return the Parent Financial Responsibility forms to Eastern Promise – Eastern Oregon University / Laurie Powell, and assist students with accessing their EOU Webster account to get registered for the course. Please note, incomplete forms and applications cannot be processed. Eastern Oregon University will provide high school students the opportunity to get a jump start on college. Students who are currently high school seniors, juniors and qualified sophomores (according to Oregon policy) enrolled in public, non-public secondary schools, or a home education program may be eligible to participate in early college credit courses either on-campus or online. Students must be 16 to become eligible to participate in early college credit at EOU. A minimum high school GPA of 3.0 is generally required. Students and parents should also understand that the amount of work necessary to succeed in college level courses will be greater than in high school courses. Prior academic performance must indicate expectation of successful completion of college enrollment and college coursework. Fees for EOU college credit programs are based upon the current policy for high school students taking courses. For the 2017-18 academic year, the tuition for on-campus/online classes is $60 per credit hour. Additional fees may be required for some courses (i.e. lab fees, etc.). If you are unsure of your eligibility or have questions, please contact Laurie Powell in the Eastern Promise office at 541.962.3941. 2017-18 Tuition for classes taken on-campus or online is $60 per credit. Interested in a Writing or Math Class? Prior to registering for math or writing courses, students must take the Accuplacer exam . You must meet the required score to be eligible to enroll in college level math and writing. Contact the Testing Center for more information. Accuplacer exams can be taken in the testing center on the EOU campus, at a regional site center, or proctored at a high school with approval from the EOU testing center director. > Consent To Release Information Form – Oregon law prohibits EOU from giving parents access to student information except with the student’s voluntary written consent.